In what seems like a perfectly coordinated long-range rescue, this Cirrus SR-22 pilot activated the Cirrus Airframe Parachute System after figuring out the plane would not have enough fuel to make it to Hawaii. What happens next is both intense and incredible, as the pilot goes from a long fall, to narrowly escaping their sinking aircraft, to being rescued by a nearby cruise liner in mere moments. 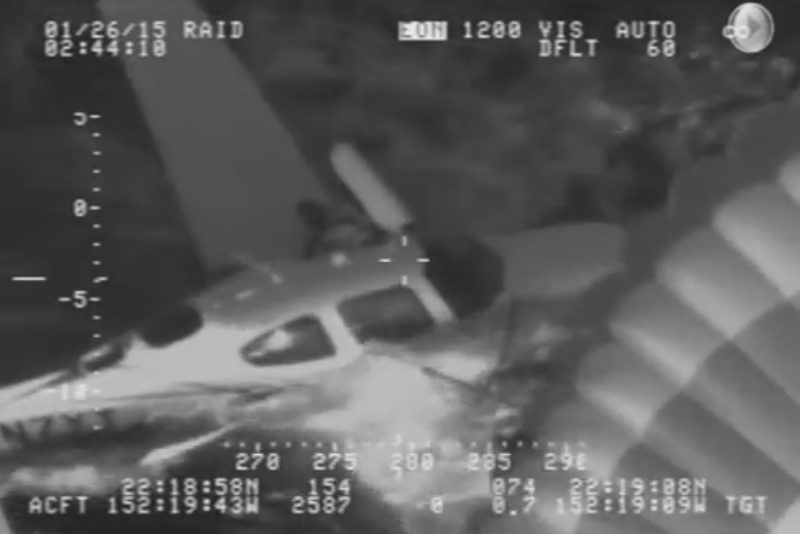 The whole affair was coordinated via the amazing rescuers from USCG Air Station Barbers Point from what is probably one of their HC-130H Hercules, which is where this FLIR imagery would have come from. Because of the long distances involved with rescues from stricken aircraft and ships on their way to and from Hawaii, which can occur well outside the Coast Guard's MH-65C Dolphin or HH-60H Jayhawk's operating radius, quick coordination with nearby vessels is key. In this case the Holland America cruise liner Veendam used one of its lifeboat-tenders to fantastic effect, plucking the pilot from their one-man life raft after only a very short time bobbing in the Pacific Ocean. The Cirrus Airframe Parachute System (CAPS), which was an extremely controversial innovation at the time of its introduction into service, is now much more widely accepted as a validated life saver, with Cirrus claiming that it has saved over 100 lives directly. You can read all about where CAPS came from and how it works here. Still, no matter how good CAPS is at brining a light aircraft down to a soft vertical landing, the fast coordination and high-caliber quality of USCG personnel is what made this near-tragedy end so well.